Frogs are amphibians. A frog spends part of its life in water as a tadpole and part on the land as a frog. They have 2 long and powerful back legs which make them champion jumpers. They have 2 short front legs that help prop the frog up when it sits or gets ready to jump. The frog lands on its front legs. Most frogs have a short body and webbed toes, so they are also great swimmers! So you can see that frogs are champion athletes – not only are they good in the long jump event, they are also good in the swimming events. They have no tail. Their eyes and nose are on top of their head. So, when they are under the water, they are still able to breathe and see clearly. They have 2 bulging eyes. Believe or not, they are able to make their eyes go in and out of their sockets! Their ears are on the sides of their head, just behind the eyes. Their long sticky tongue is attached to the front of their mouth. Frog range in size from the tiny 10mm (0.4 inch) Brazilian Gold Frog to the enormous 30 cm (1 foot) Goliath Frog. Like all amphibians, frogs are cold blooded vertebrates, so their body temperature is the same as the surrounding temperature. Their skin allows liquid or gases to pass through. They must keep it moist. They do not drink water through their mouth like us, they absorb water through their skin! Therefore, they often live in or near wetlands like lakes, ponds and streams. These habitats help to keep their skin moist. There are some that even live in trees. Unlike tadpoles, which use gills to breathe, the frogs have lungs to breathe and they also breathe through their skin. They lay eggs in puddles, ponds or lakes. The eggs will hatch into larvae, called tadpoles. You can find frogs from the tropics to the subarctic regions. The only place which you cannot find frogs is in Antarctica and on islands in the middle of the sea. There are even frogs that live in deserts! However, most species are found in tropical rainforests. There are more than 5000 species of frogs. Unfortunately, some species of frog are in decline because of pollution, climate change, destruction of wetlands and diseases. For example, the Golden Toad of Costa Rica has recently been classified as an extinct species. Many efforts have been started to try to rescue the frogs. For example, zoos and aquariums around the world named 2008 the Year Of The Frog in order to get the word out to everyone that frogs need to be protected. Their skin can be smooth, lumpy or folded. Frogs whose skin is lumpy and dry are called Toads. Most frogs have long hind legs for jumping but toads have shorter hind legs. Frog usually live near wetlands but the toad often live in drier areas. However, the Fire-bellied toad which has skin which is slightly warty does prefer to stay near the wetland. Frogs are active day or night, but toads are normally active at night. Frog go underwater when it smells danger, but toads typically burrow in the ground. A frog’s eyes stick out. A toad has poison glands just behind their eyes. Most frogs lays eggs in clusters but toads usually lay eggs in long chains. Many frogs have webbed toes, and frogs which spend more time in the water will have a fully webbed toes. For example, the African Dwarf Frog spends all its life in the water, and has fully webbed toes. 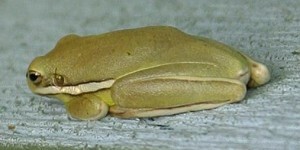 But White’s Tree Frog, which lives in trees, has only half-webbed or quarter-webbed toes. Frogs which live in trees have toe pads to help them climb. These sticky pads will not stick if they are very wet. These tree frogs have hip joints which allow them to hop and walk. Some frogs that live high in trees have a very webbed toes even though they don’t live in the water. This skin between their toes helps them to glide gracefully from one tree to another tree! Frogs which live on the ground have smaller toe pads. Some have no toe pads and not much of web. Some burrowing frogs have a toe extension that helps them to burrow into the ground. The frogs which stay on the ground have more muscular hind legs than those which live in or near the water and in the trees. Frogs are the best jumpers of all vertebrates. For example, the Australian Rocket Frog can jump over 50 times its body length! That’s a jump over 2 metres (almost 7 feet) by an animal smaller than a hand! The bigger the frog, the further it can jump – if you compare frogs of the same species. However, if you compare different species, the smaller frogs may be better jumpers than the bigger frogs. Frogs do suffer water loss through their skin. Their skin allows water and oxygen to go through it. 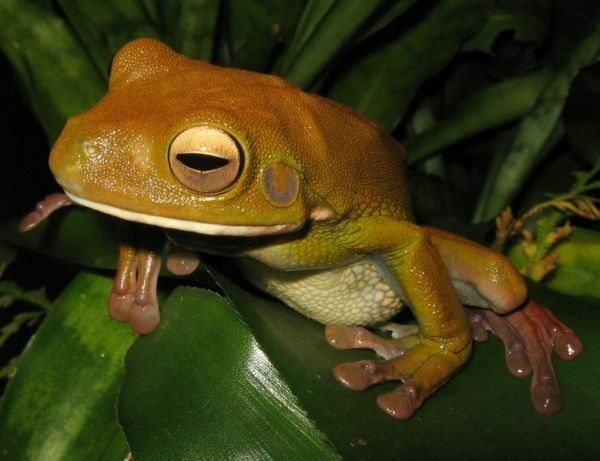 Some tree frogs’ skin has a waterproof layer to help keep the water in the body. Some frog species will rest in large groups, each touching the skin of the others. This reduces the amount of skin being exposed to the air or to dry surfaces. Therefore, this position helps the frogs to reduce water loss. These adaptations are only suitable for frogs which live in the trees and are not suitable for frogs which live in extremely dry places. Desert frogs, for example, use other methods to preserve their water. Frogs are able to change colour and blend into the background to protect themselves from their enemies. Most of these kinds of of frogs are active at night and they are able to hide themselves well in the dark. Some frogs have only the ability to change between one or two colours. For example, White’s Tree Frog can change to green or brown. 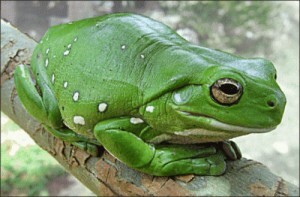 The temperature, health, humidity and the colour of their surroundings can affect what colour a White’s tree frog is. Tree frogs usually have smooth skin which help them to hide among the leaves effectively. Some frogs change colour between night and day. Most frogs have mild poisons which protect them from their predators. Toads have large poison glands behind their eyes, just on the top of the head. The Poison Dart frogs is so poisonous that the native people of South America catch the frogs, boil them, and dip their weapons in them for hunting. When a frog is underwater, oxygen passes through its skin for breathing. On the land, adult frogs use their lungs to breathe. They breathe by taking air through their nostrils. Some species of frog can survive in places which has very little oxygen in the water. For example, the Lake Titicaca frog can survive in the poorly oxygenated waters of Lake Titicaca. It has wrinkly skin – this means there is more skin exposed to the water, so it can absorb more oxygen. The frog’s digestive system starts at the mouth. Frogs have teeth along their upper jaw. The teeth are used to grip their food and also to grind their food before they swallow it. These teeth are very weak and cannot be used to catch or harm fast moving prey. The frogs will use their sticky tongue instead to catch fast moving prey. Toads have shorter tongues than a typical frog. The life cycle of a frog starts with an egg. The female frogs lays thousands of eggs in the water. The clumps of eggs are covered with jelly which helps to keep the eggs safe from predators and to retain moisture. Some species, such as the Cane Toad, lay poisonous eggs so that nothing eats them. The length of the egg stage depends on the species and on the environment. Eggs laid in water generally hatch within one week. Eggs hatch into tadpoles. A tadpole has an oval-shaped body and long flat tail for swimming. Most tadpoles live in the water. They do not have eyelids, and they have gills for breathing. The gills are on the sides of tadpoles’ head. Some species lay eggs that do not hatch into tadpoles. They hatch into small frogs straight away. These small frogs do not have gills but they have special skin to help them breathe. They have a mouth with no teeth. Most of them eat algae and small water plants, but some eat insects, smaller tadpoles and small fish. Many tadpoles are eaten by fish and birds like kingfishers. There are poisonous tadpoles like Cane Toad tadpoles. The tadpole stage may be as short as a week. At this stage the gills start to disappear and the front legs appear. Their hind legs grow first. Their jaws get bigger. They began to have eyelids. Their tail gets shorter and shorter until finally they have no more tail. Their lungs get bigger and soon they can breathe through their lungs and go onto the land, but some continue to live in the water as adults. Some species of Poison Dart frog lay eggs on the forest floor instead of in the water. To protect the eggs, the female frog will guard her eggs and keeping them moist. She will pee on the eggs if they become too dry! Other frogs carry the eggs and tadpoles on their hind legs or back, for example, the Midwife Toads. Some frogs even protect her babies by putting them inside their own bodies! For example, the male Australian Pouched frog has pouches along its side. The tadpoles stay inside these pouches until they become frogs. Almost all species of frogs are carnivorous as adults. They eat insects and worms. A few larger species may eat fish and smaller frogs. There are a few species of frogs which only eat plants. Adults frogs are eaten by birds, large fish, snakes, otters, foxes and other animals. Frogs also get eaten by people. Frog legs are a delicacy in China, France and the Philippines – the frogs used for cooking are raised commercially. Frogs and toads can live for many years. Captive frogs and toads have been recorded living up to 40 years old. Frogs do hibernate through the winter, and there are 4 species which even freeze solid during the winter! Some frog calls are very loud. Every species of grog will have a different call. They call to attract a mate. Many species call to mark their territory and chase away other males. Tropical species call before a rain shower. All of these calls are made by the frogs when their mouths are closed. Isn’t that interesting? But when there is danger, some frogs will make a different call with their mouth open.